Green infrastructure in general and urban trees in particular are considered to be key elements of urban climate adaptation strategies. Yet, there are open questions related to ecosystem services: how much can urban trees really provide and which tree species are adapted to climate change? The aim of the project is to contribute a better understanding of the linkages between tree growth, phenology and ecosystem services of urban trees. Students from different Central European cities and communities (Salzburg, Vienna, Weer, Dresden, Szeged) collect data with a web app on the phenology (leaf growth, flowering, fruits, foliage colouring) and different growth parameters of trees. The data are analyzed in the project group. Those results illustrate the reaction patterns of different tree species to the weather conditions in a city and the reaction patterns of the same species to the weather conditions in different cities. Since urban trees reflect the urban climate, students learn to characterize climatic regions by means of weather conditions, climatic and phenological data, and to understand the interactions between urban climate and urban nature. Future scenarios of climate change are represented by those cities in the project network that are already characterized by drier, hotter summers and by more frequent severe rainfall events. In addition to the phenological observations, measurements are made on the leaf area, lowering of the surface temperature by the tree shadows and continuous microclimate measurements at tree sites. 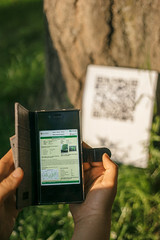 Students not only produce quantitative assessments of the climatic regulations of these urban trees, but also express their research results and project experiences in an artistic way. This way, they can creatively work out the importance of urban trees from their own perception. The combination of different perspectives enables a valuable intercultural learning experience.